Headlights play an important role in helping you drive at night and in foggy conditions, and they tend to fade and become dirty, yellow or discolored over time. They may still work as headlights go, but they’re not providing you with the best of service. It might be time to give them a good cleaning or a headlight restoration. Stop at Wagner Kia of Shrewsbury and allow us to give you some tips on DIY headlight restoration. Sandpaper – This works well in getting rid of dents and scratches, but be careful to not damage surrounding area. Insect Repellent – Saturate a rag with insect repellent with DEET. Do not spray directly on the headlight because it can damage the paint. 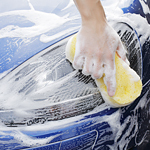 Wash the headlights and dry with a clean rag or paper towel. DIY Kits – Available in automotive stores, these will do the job but also require being careful to not damage the paint or the light. We offer a wide variety of automotive services and supplies. Come to our Shrewsbury dealership and let us service your vehicle for you.